The Cuisinart DTC-975BKN Thermal 12-Cup Programmable Coffeemaker, the only machine of it’s kind on the market, has everything you could possibly ask for in a traditional brewing machine. This Premier Series Coffeemaker features a classic, minimalist design style coated in black with a touch of elegance in the stainless steel accents, making it a welcome addition to any counter top space. Non thermal coffee machines with glass carafes covered in coffee stains can be unsightly. The aesthetically pleasing surfaces of this coffeemaker, however, are not only easy to clean, but easy to keep clean as well. The simplistic functionality oriented approach taken in creating the placement of buttons and in designing the programming system ensures that this will be an easy machine for anyone, old or young, to understand and use the machine with the utmost ease. One of the hardest things about making coffee in the morning is that most people aren’t quite awake yet when they brew their first cup in the morning. People drag themselves from slumber to go prepare their coffee in a zombie-like state, unable to function until the task is complete and the rewards reaped. This can be a time consuming and sleep robbing ordeal. With a fully automatic machine like this, no one ever has to sacrifice those last precious minutes in bed to get up and brew the first pot again. Cuisinart designed this coffee maker to be fully programmable, so coffee can be set to brew in tandem with the morning alarm clock. Fumbling through the dark in the early hours becomes much easier to do when there is already a freshly brewed pot of coffee lying in wait. These benefits apply to the office as well. Gone are the days of relying on coworkers to brew a fresh pot in the morning. By setting the machine to turn on before arriving at the office, no one has to take the blame for forgetting to start it up. 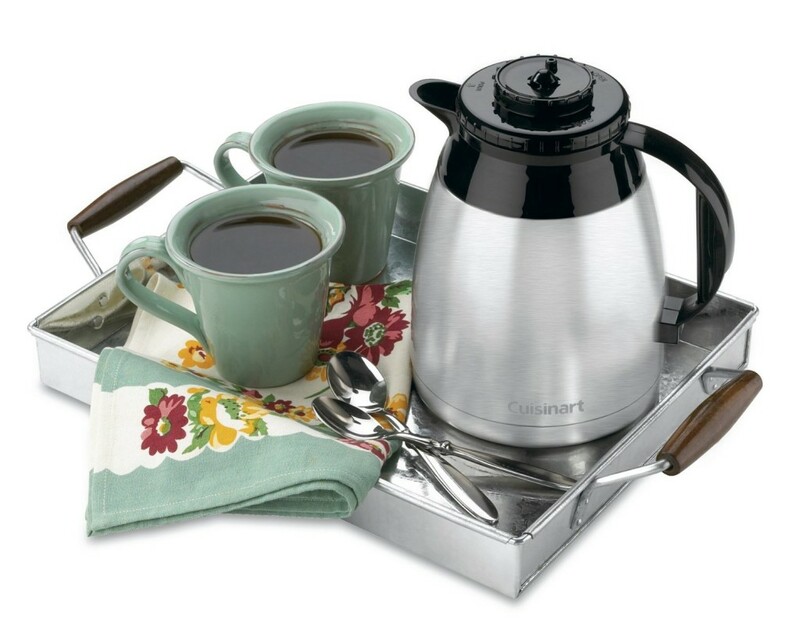 The 12 cup stainless steel carafe features an insulated double-walled construction. The patented Brew Through and Pour Through lid that allows coffee to rain into the carafe while keeping it sealed from air is a unique way of ensuring that the coffee stays fresh and flavorful. These features combined also mean that coffee won’t go cold if someone oversleeps or brews more than they need right away. Coffee will stay warm and delicious for hours. The automatic shutoff capability means that power won’t be wasted once brewing is complete, when the machine will alert coffee drinkers to the fresh pot with an audible beep. For those in a hurry, the Brew Pause feature allows for pouring a cup from the carafe to enjoy a bit of liquid gold before brewing is complete. The convenient, easily visible water level indicator makes keeping an eye on refills a snap. Some have complained of misalignment issues with the lid, coffee can sometimes spill, but this is a simple problem that is easily corrected by realigning the lid. 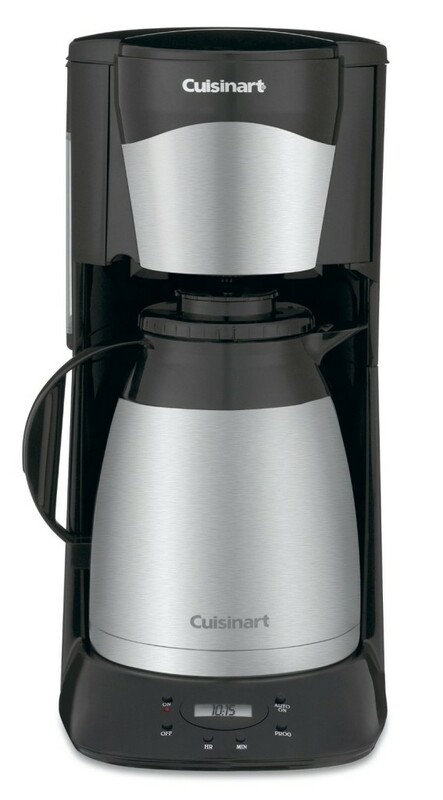 Overall, the Cuisinart DTC-975BKN is a solid coffee maker that should be suitable for anyone.